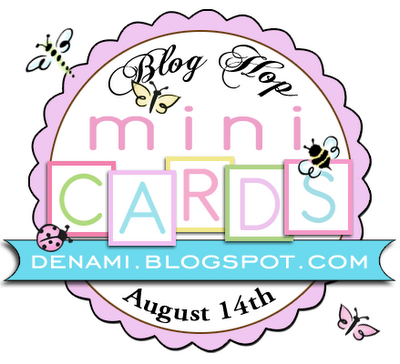 DeNami August Blog Hop: Mini Cards | Work in Progress. 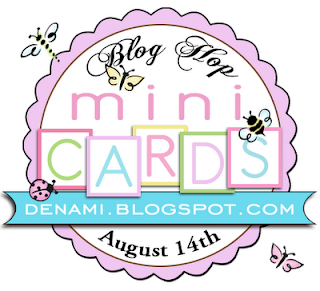 Hope you are enjoying the August DeNami Blog Hop! Time to go small or stay home LOL! You should have arrived here from Pattie Goldman's fabulous blog. If not, head on over to the DeNami Blog for the master list of hop participants. You'll want to stay on track… leaving a comment on every blog along the way (including the DeNami Blog) gives you a chance to win one of TWO $20 DeNami gift certificates!!!! Another $20 gift certificate will be given to a randomly chosen blog hop participant! These cards measure 4.25 x 4.25". I used Spellbinders Create a Flake 2 dies to make a negative die cut in the white carsdtock. On the base, I stamped the Lacy Flake in Versamark, added some Judykins Sticky Stuff, heated it up then added glitter. The Judykins Sticky Stuff works SOOO much better for glitter that the glue pads IMHO. Then I heat embossed each of the sentiments in silver. So cute! The colors are awesome - love that textured cardstock!!! I started with a 5 x 3.25" piece of vellum. I dry embossed the vellum for a bit of texture. Then I scored at 1.5" from each side and 0.5" from the bottom. Then use adhesive to adhere the flaps to one another and create the little envelope. I then took a circle punch to cut a little piece out of the top to make removal of the card easier. To make the card, I cut a piece of card stock at 5.5" and 1 ⅞" and scored in the middle. I attached the entire envelope to a tag so that it can be attached to a gift. These would make really cute, reusable Christmas tags - you'd just have to replace the card inside the envelope. Hope you enjoyed my blog hop offerings! Your next stop of the hop is the talented, Debbie Marcinkiewicz! I'm sure she has LOVELY mini treats whipped up for you! Posted in blog hop, christmas, Denami, Mini cards, tags, vellum envelope . Bookmark the permalink. RSS feed for this post.